'Team Thayer Slayer' of Washington Township High School had one of the more advanced 'ballista' designs, modeled after the mechanics of a crossbow. Sometimes, the nerds get to be the cool kids. For instance, teams of science or engineering-oriented students gathered Friday on a vast South Jersey field. And using re-created medieval weapons of war, they hurled pumpkins hundreds of feet down the field. Or in the case of a hapless team of Temple University students, they launched an orange orb backwards into an amused and unharmed assemblage of bystanders. And even when the Temple team did manage to fling a pumpkin in the intended direction, they were continually bested by two adjoining teams of high school students from Washington Township in Gloucester County. Ah, to be a cool high school kid who beats college engineering students at their own game. First and second place were taken by high school teams from Millville; third by a a high school team from Washington Township. 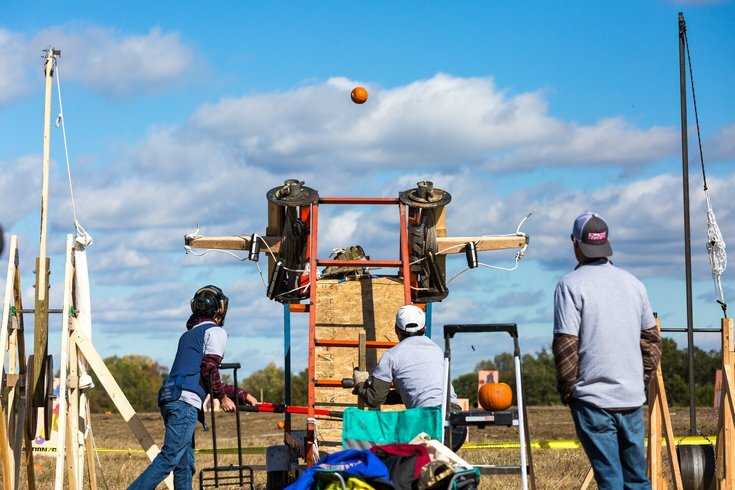 Friday’s event was the 13th Rowan University Pumpkin Chunkin’ catapult and trebuchet competition, and the first held on the grounds near a new university technology park facility in Mullica Hill. Rowan's American Society of Mechanical Engineers hosted the event. Attending the competition were the Burlington County Institute of Technology, Cape May County Technical School, Millville High School, Washington Township High School, Cherry Hill High School East, Glassboro High School, Philadelphia University, Temple, The College of New Jersey, University of Delaware, and Widener University. Rowan University's chapter of the American Society of Mechanical Engineers (ASME) hosted the event at their Mullica Hill campus, attracting students from many South Jersey and Pennsylvania high schools, colleges, and universities. 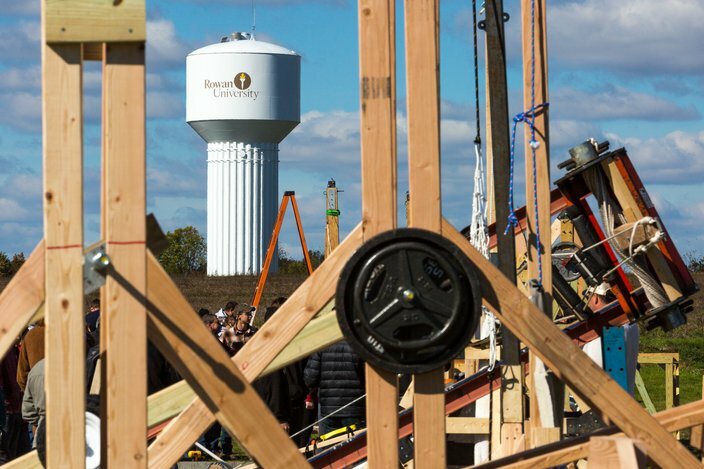 In all, there were 21 launching machines on the field, according to Rowan senior Justin Ruegg, who wore a crown to denote his position as emcee and president of the student engineering society. More than 100 spectators, many in costumes – including armor and chainmail – gathered to watch the hand-crafted catapults in action. There was a friendly – but fierce – rivalry, especially between the two teams from Washington Township. While most of the designs were devices known as trebuchets, James Gallicchio, 16, a sophomore, designed a torsion ballista – a twist of ropes cranked very taught, then suddenly released – for his team. It's sort of as if Katniss Everdeen of the "Hunger Games" was using artillery instead of a recurved bow. Members of Gallicchio's third-place winning team included students Kyle Lucero, 17, Michael McEntee, 15, Nick Curcio, 16, Catherine Nguyen, 17, Angelo Pingol, 18, who cranked the cable, and Arash Vahidi, 18, who wore a catcher’s mask and a Kevlar vest for the all-important task of cutting the cord with shears, sending the pumpkin hurtling. Billy Myers, 16, led the design of the more conventional trebuchet machine – with its counterweights – used by the rival team from Washington Township. That team included Brandon Hickson, 17, Andrew Krawice, 16, Stephen Cozzone, 16, Deven Patel, 16, Grace Robertson, 16, and Brianna Myos, 14. Myers said construction took about 10 days. His team trash talked its rivals, taunting their hurling device must be unsafe given the body armor donned by Vahidi. But he also conceded the ballista is a bit more accurate than the trebuchet. 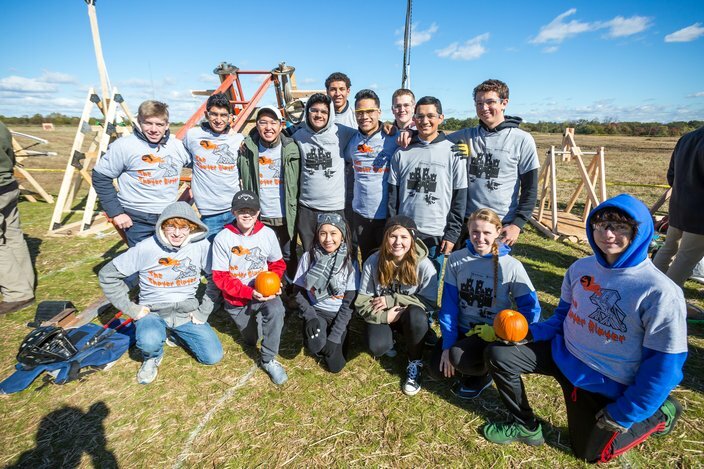 Two teams of students from Washington Township High School competed in the 13th annual Pumpkin Chunkin at Rowan University, Friday, Oct. 28, 2016. Tristan Cossaboon, a high school senior, was among the Millville competitors. He has Asperger's Syndrome, a high-functioning form of autism, and put his heart into the competition because he’d like to become an engineer, explained his mom, Kathy. But instead of breaching fortress walls, Cossaboon told PhillyVoice he wants to design and build rollercoasters, his favorite machine.